It's the fastest way to tweet a storm -- from your Mac desktop. So far only a few people have used the new Electric Pork software. I need other people to try it out and let me know if it works. Historically that's often been the readers of this blog! So you are hereby enlisted. If you have a few minutes, and a Mac, and something to say that's more than a couple of tweets long, please download the software, log on via Twitter, and post something. Other things to look at. After you've posted you will have an RSS feed. Mine is located here. Yours will be at a similar address with your Twitter username in place of mine. The names are case-sensitive, so be sure to spell it in the same case as your Twitter screen name. Try out the settings. 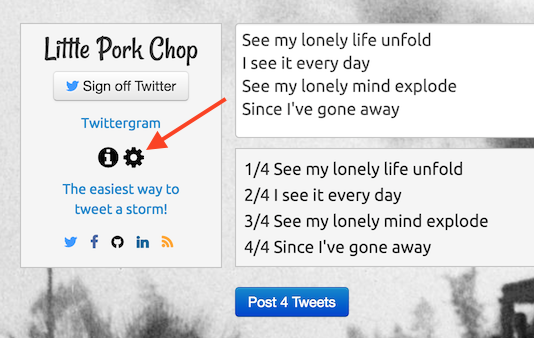 You can change the delay between tweets, reverse the order add a hashtag to every tweet, and configure your RSS feed. Click on the gear in the command panel to the left of the text area to access your settings. If you have questions or comments please post a comment here. If it works say so please, and provide a pointer to the tweetstorm you published. Thanks for your help testing the new software.